Whether you're starting up a new breakfast diner and need a commercial toaster or are looking to replace your old toaster in your sandwich shop, we have the right one for you. 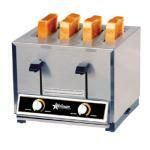 Our toaster selection features equipment from trusted manufacturers such as Star, Hatco, and Toastmaster. When purchasing a new toaster you should consider roughly how much volume your toaster is going to have to handle on a daily basis. 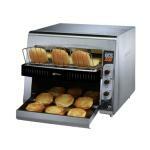 Fortunately, we offer a wide variety of toasters to ensure we have one that will meet your needs. We provide several different styles of toasters including slot toasters (also known as pop-up toasters), conveyor toasters, and contact toasters, all of which have their own advantages. For example, slot toasters are great for toasting to order but do not have as much output potential as a conveyor toaster. Slot toasters would be more ideal for a smaller breakfast diner while a conveyor toaster would be better suited for a bustling toasted sub shop. 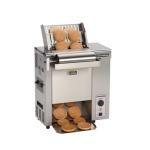 Regardless of what you desire out of a toaster we have the right piece of equipment for you! Also, don't forget that our equipment specialists are available for any questions you may have about our toaster selection and they can be reached at 1-877-236-5780. In addition, we also have a "Toaster Buying Guide" that can help you more thoroughly understand the different styles of toasters.